What is a Winter Weather Event? A winter weather event is any weather event that exceeds two (2) inches in frozen precipitation. Winter weather events include snow, ice, freezing rain and sleet. Different types of moisture require different methods of treatment. Public works evaluates each event on length, intensity, temperature and time of day to determine the most effective method of treatment for that event; even if an event does not reach the two (2) inches of frozen precipitation needed to be classified as a winter weather event, public works will still treat roads, City-owned sidewalks and trails. How does Public Works prepare for an upcoming event? During normal business hours, public works staff uses reports issued by Weather or Not and local radar reports to assess a potential event to determine if will need 24-hour operations. After hours, city staff and emergency responders keep operators informed of changing road conditions and the need for winter weather operations. When do the streets get cleared? Driving on roads during a winter weather event can be dangerous. There are several ways that residents can assist Public Works. First, be patient. Second, prioritize your vehicle trips. If the weather forecast indicates a significant weather event is coming, consider making your trips to the grocery store or pharmacy in advance. Once the event is here, only make those trips absolutely necessary. Finally, remove your vehicle from the street. Many of the streets are narrow with ditches on both sides. Vehicles parked in the street make it difficult and unsafe for a snow plow to pass down the street. This can make it difficult for emergency vehicles or needed vehicular traffic to maneuver safely. Vehicles that are left on the street during a winter weather event are subject to being towed away at the vehicle owners' expense within two hours of the start of the event, per Chapter 13 of the Municipal Code. The City recommends that all residents shovel their driveways like the picture shown below. Shoveling an extra six feet to the left of your driveway along your street will prevent snow plows from moving snow back onto your driveway as they drive through. 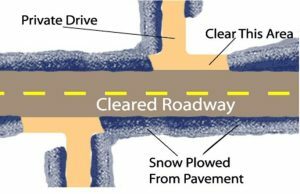 Article 4 of Chapter 13 of the Edgerton Municipal Code requires adjacent property owners to remove snow and ice on sidewalk within 48 hours from the time a snow fall or ice storm ceases. It is unlawful to place snow removed from private property onto public streets, alleys or sidewalks. For ice or compacted snow, property owners may use ashes, sand or other noncorrosive chemicals to make reasonably safe for pedestrians. Owners or occupants who fail to clear the sidewalk may be cited in municipal court or the city may remove the snow or ice and assess cost of removal to abutting lot(s).